“What Solomon didn’t Say” is a source of information that dives into the arenas of personal spiritual health, marriage and relationships and life maintenance. Solomon, the youngest son of David gives us the Proverbials of wisdom to lead and guide the hearts of men and women. 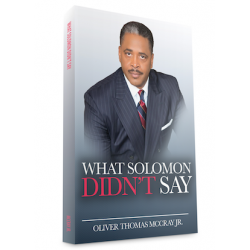 Now God has given Bishop Oliver T. McCray Jr. a Maxim that adjoins itself as an offspring of Solomon’s writings with a 21stCentury urban twist. This book will pierce the darkness of the mind, while raining fresh manna upon the soul.